Funny enough, the two coasts are coming together way after we had already planned today's installment of From Sea to Shining Sea (I get to finally meet this California editor next week during a press trip!). But I digress, Ariana of Hey Wedding Lady is back on Tidewater and Tulle today with one of her beautiful boards inspired by California's iconic redwood trees and spring... perfect inspiration for a wedding in the local forests of Chesapeake and Williamsburg! 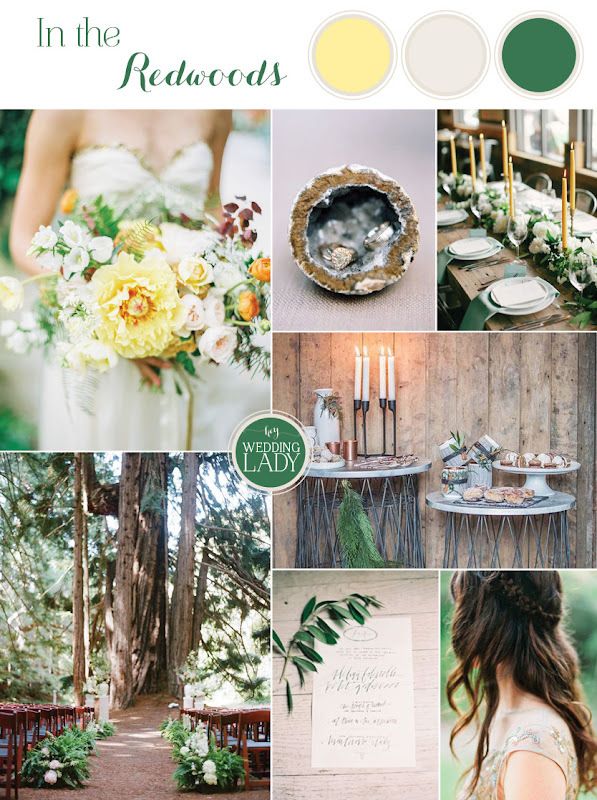 For this spring inspiration board, I wanted to focus on one of the most unique features of the Bay Area and design a board for a redwoods wedding. I started my wedding career working at an amazing venue in the Santa Cruz Mountains, where we held ceremonies in the heart of a hundred-year-old redwood ring. The trees tower over everything around them, creating a breathtaking natural cathedral and making it perfect for a meaningful and unique ceremony. The unique beauty of the redwoods has drawn couples from all over the world to tie the knot in the Central Coast, and while each of them brings their own personal style, there's just no denying the California boho vibe of the woods. To capture that, I wanted to keep the materials very natural and organic -- loose, lush florals, raw wood, and lots of local greenery. We're a pretty laid back people over here on the West Coast, but there's no reason not to keep things stylish with chic bohemian details. A loose, braided hairstyle and a sweetly embellished gown make for a picture perfect bride in the redwoods, while a natural palette of soft yellow, ivory, and fresh green captures the inherent beauty of the forest. You can get to know this California wedding blog more on Facebook, through her pins on Pinterest, and captures on Instagram!